Bishop Graefenstein (centre), Rev. Dimintroff (second from right), and the delegation headed to Yalta with humanitarian aid. There was a buzz in the classroom. The seminary students had heard they may receive a visit from their bishop, Rev. Dr. Viktor Graefenstein, this weekend. Bishop Viktor lives in Marburg, Germany, and his visits to Odessa, while consistent, are not always planned far in advance. Whenever he sees a need or wants to make the trip, he drives—some 30 hours one way—usually pulling a trailer full of humanitarian aid. I met Bishop Viktor 15 years ago in St. Petersburg, Russia, during my previous mission service there. He sat behind me during a major meeting (Sinod in Russian) of ELKRAS, a now-defunct entity that tried to draw together all German Lutheran believers then living in the former Soviet Union. As the Lutheran Church–Missouri Synod representative, I was given a courtesy invitation. My task was to try to understand the rebuilding of the Lutheran church after the Soviet collapse and what role LCMS Lutherans might be allowed to play. Bishop Viktor was one of the leading voices of Lutheran churches in Ukraine. What made this particular meeting most memorable was the open and very public clash between Viktor and the presiding ELKRAS officer, the celebrated Lutheran theologian Georg Kretschmar. It hinged on women’s ordination and the German State Lutheran Church’s decision to bring female pastors immediately into Russian and Ukrainian ministry. Apart from being contrary scriptural teaching, this was an unprecedented action, with no prior consultation. Bishop Kretschmar wanted to move quickly over the thorny question. But Bishop Viktor refused to be silenced. Finally, after loud parliamentary objections, Viktor rose and informed President Kretschmar that Ukraine Lutherans would walk out of the Sinod and never return. Kretschmar suggested they adjourn to a quiet room, suspend the agenda, and try to resolve female pastors’ activity in Ukraine. Bishop Viktor said no, he would not accept “secret discussions” and right then and there walked out with his entire delegation of Lutherans from Ukraine. Today’s meeting gave me a chance to get reacquainted. This time Bishop Viktor led a delegation of 10 German-Ukrainian Lutherans who now live in Darmstadt,Germany. They collect aid for some of the aged Lutheran pensioners and travel back into Ukraine several times every year. This delegation will worship with us today, Sunday, and then continue 650 kilometres to Yalta in Crimea. Bishop Viktor explained that there is only a Lutheran Prayer House in Yalta, not a full-fledged congregation, because there are no funds to support a Lutheran pastor. Two elders from the delegation presented sermons and then Bishop Viktor preached his own sermon. This is a regular part of Ukraine Lutheran worship, with three sermons the norm at Sunday worship. Some of our seminary students had travelled Friday night to Dnepropetrovsk to celebrate the 20th anniversary of Alpha and Omega Christian Student Fellowship. The guest preachers from Germany were welcome as seminary students often have the privilege of preaching on Sunday mornings. After a quick lunch at a downtown Odessa cafeteria, the delegation (a van and a minibus) were back on the road to Yalta, dropping me off first at the seminary. Classes resume tomorrow, on biblical teaching concerning the Christian Church as the Body of Christ. Today’s international flavour at worship makes a perfect introduction into the very meaning of the term “Body of Christ” for pastors-to-be in Ukraine. Rev. Dr. James Dimitroff is pastor of Grace Lutheran Church in Saskatoon, Saskatchewan. He is currently teaching at Concordia Seminary, Odessa. 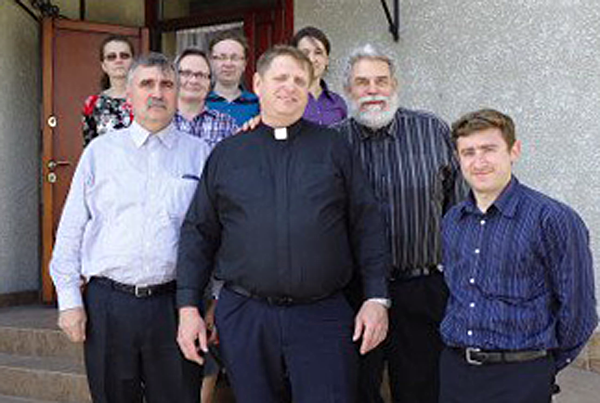 Preparing Lutheran pastors for the Synod of Evangelical Lutheran Churches in Ukraine is a project of Lutheran Church–Canada financially supported by Concordia Lutheran Mission Society.